As my love for horses grew, so did my collection of toy ponies. My prized possession as a 6-year-old was a stick horse I named Trigger. Trigger and I did everything together, and we were pretty much champions at every competition we entered (probably because I was usually the judge). 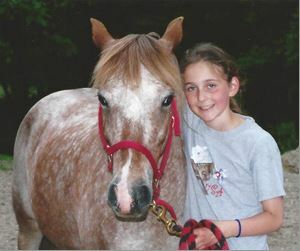 For several years, I was content to ride Trigger through the empty pastures around our home. But as time passed I became less interested in my shenanigans with Trigger and a bit more adamant about wanting a real pony. In my 8-year-old mind, I was destined to be National Velvet and Alec Ramsey from the Black Stallion all rolled into one… if only I had a real steed to carry me along. As the Christmas of 2003 approached, I put my foot down and determined that this was the year Santa would bring me a pony for Christmas. I went to work writing him letters and letting him know that I would be satisfied with nothing less than a pony. I even told the big man in person when he visited the local fire department! I don’t quite remember what Santa said about my request, but I do specifically remember what my mother said. “Nonsense!” I thought in my 8-year-old brain. Of course he does! A girl in my third-grade class told me he has a magical flying horse trailer to haul them in. My mom stuck to her story, and I stuck to mine. When Christmas Day rolled around, I discovered my mother was, indeed, correct. There was no pony waiting for me by our deck as I had anticipated. The girl in my class had lied! However, Santa had left an enormous bag of horse treats, a riding helmet and a hoof pick. I was furious. What was Santa thinking! Who does he think I’m going to feed thesehorse treats to? I’m not going to eat them myself! Could it be?! Was this the moment I had been waiting for? I raced to the front window of our house and peered outside. Tied to our deck was the most beautiful creature I had ever laid eyes on with a big red bow tied around her neck. Her name was Ginger, and she was a 12.2-hand Pony of the Americas mare. And to me she was like the Pie, the Black Stallion and Flicka combined. That Christmas Day marked the beginning of my adventure (actually, I would call it more of an addiction) with horses. But there couldn’t have been a happier little girl in the entire world at that moment in time. The whole day was spent bundled in 15 layers of clothing riding through the snow onmy very own pony. I had no idea how to ride yet, so my mom’s cousin, Bruce, who had been boarding Ginger at his farm until the big day, led my brother and me around the yard. We assembled a make-shift stall in our garage for Ginger to live for the day. I tried convincing my parents that she should live there until spring, but it turned out she had to stay with Bruce until we built a paddock and loafing shed. That evening, after Ginger had been hauled back to her temporary home, my mom and I snuggled up to read a book I had received as a Christmas gift. It was called “My Pony,” by Susan Jeffers, and it tells the story of a young girl who wants a pony so badly, but she must be content with her imaginary horse named Silver. It could have been written about me only a day earlier. Unfortunately, 12.2-hand ponies don’t grow along with their little girls, so eventually I began looking for my first horse. I didn’t have to look far. Bruce bred and raised team penning horses, and I fell in love with a small American Quarter Horse mare named Darcys Golden Acre, or “Goldie” for short. I had to have her, so I devised a plan. I wrote Bruce a brilliantly crafted letter, explaining that I would like to buy Goldie for whatever meager amount of money I had and would work to pay him back the rest. I’m not sure where I thought I would acquire a steady job as a 12 year old, but that didn’t seem to matter. It all sounded great on paper! Bruce must have thought my letter was a real hoot, because he gave me the horse. As I previously mentioned, horses are addicting. They’re like potato chips – you can’t have just one. I think at one point our limit was two, and then somehow it became three … and then four. So I’m going to stick with that for now. Eleven years after finding an adorable pony tied to our deck on Christmas Day, my family has two Quarter Horse mares, a Thoroughbred gelding and a very special POA pony named Ginger – yes, we still have her. The moral of the story is that Santa doesn’t bring ponies, and that’s OK.